Cardio programming is an essential part of a complete workout program. Often, people overuse cardio as a weight loss tool. While cardio workouts do burn fat, they can also break down muscle if inappropriately programmed. Cardiovascular fitness can take on many forms. The cardiovascular fitness necessary to complete a marathon is completely different from that necessary to complete a “Tough Mudder” race. Cardio training is important to participate in endurance events, to improve cardiovascular fitness, and to achieve leanness and fat loss. Understanding your anaerobic threshold, or the point where your body begins to burn purely carbs as fuel, as opposed to using fat as the main fuel source, is helpful. Your training should be set up to accomplish your goals, whether your goals are making a personal record in a triathlon or marathon, or just getting leaner. At Reb-L Fit you can take advantage of your cardiovascular fitness through a variety of paths. You can meet with a coach to discuss your fitness goals to decide what level of cardio programming is right for you. If you are interested in an endurance event, such as a 5k, a triathlon, a half marathon or an ironman event, then you should know your heart rate training ranges. Your Reb-L Fit coach can test you to establish those ranges, and help you decide how to improve on them. If your goals are to increase leanness, overall fitness, or simply to lose fat, your cardio training should be part of a balanced training regimen. I can give you guidance for your heart rate based cardio training, as well as which Reb-L programs will help you best. One of my secrets is using weight training. Weight training does increase cardiovascular fitness. Weight lifting forces the heart and lungs to work hard to deliver fuel and oxygen to working muscles. Your cardio fitness can also be significantly improved by participating in our workouts. I use weights to drive the heart rate up and increase the body’s overall cardio fitness. Workouts use free weights to drive the heart rate up in a full body workout. I program metabolic conditioning and free weights into our body area training to drive cardio fitness while increasing muscular endurance. Testing and consultations are available to help you decide the best cardio programming for you. Let’s meet to plan out your ideal program, and the best program schedule to reach your goals. The Reb-L Fit Nutrition Program is a personalized program, designed around each individual. It is based on the lean mass, goals, and challenges of each person. We begin by taking your body fat measurements to determine the ideal macronutrient balance – or protein, fat and carbohydrate intake to maintain your current weight. (Macronutrients are proteins, fats and carbs.) You track your food intake for a few days, and we compare what you need to eat to your activities. The next step is to estimate the ideal weight and lean mass for you and set up your long term and intermediate goals to reach your best body composition. As your nutrition coach, I plan out a program for you. We estimate a timeline; how long it can take to reach your goals, and the best nutrition plan to accomplish them. Together, we decide whether you begin with a focus on fat loss, lean gain, overall balance, or performance; you have to eat differently for each! The ideal balance of fat grams, protein grams and carbohydrate grams are then organized for you into a per meal and per day set up that you use as guide. You can choose the food you eat, and I help you understand which foods will fit each macronutrient category best. Often times challenges with getting lean, increasing muscle, recovery and sports performance stem with getting too little of the right macros (protein, fat and carbs) at the appropriate times. Consistency is important, as is timing and balance. This nutrition program is successful because it is based on your current body composition, your current habits, and your future goals. I will guide you, and you will have my support, as well as the support of other Reb-L Fit nutrition plan members to stay on track. You can email or text me anytime with questions, and you are added to a private face book group where you can post challenges, questions and successes in a safe and friendly environment. You report weekly via email, or in person, depending on where you are in your progression. We will meet at a minimum of once a month to check in and take your updated body fat measurements, as well as to work through challenges and plan next steps. The Reb-L Fit nutrition program is a healthy, scientifically based set up. I use current industry based recommendations for the necessary protein, carb and fat intake of each person. We focus on feeding muscle, stimulating metabolism, and changing poor eating habits so you can make a permanent lifestyle change. You have flexibility in food choices, and you receive the education you need to reach and maintain a healthy body fat and lean mass balance for life. Personal macro nutrient profile using a break down of carbohydrates, protein and fats best suited to the you and your goals. Profile based on body fat measurements, age, gender and lifestyle. Recommended 3 month program minimum for maximum results. Bodybuilding, Figure, Physique and Bikini competition is both a sport and an art form. A competitor learns discipline, focus and endurance, as well as how to sculpt the body into a stage worthy figure. There are many ways to train for a competition, but there are fewer ways that are sustainable long term, that can evolve into a healthy lifestyle. 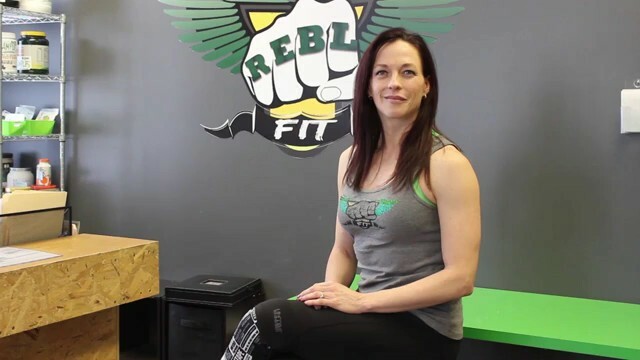 At Reb-L, I work with competitors to teach them proper eating habits that can lean them out for the stage, and help them stay lean, strong and healthy long term. Nutrition programming is personal and continuous. The focus is on eating enough food, and the right balance of macronutrients like fat, carbs and protein to gain lean mass and lose fat. I program weight training for the individual. The type of competition, the competitors current fitness and abilities are considered, and their programming is set up according to competition timing and the competitor’s needs. Part of every competition includes posing and preparing stage presence. Our instructors are experienced competitors with multiple top 5 placings and pro level status. Competition is a serious sport. Choosing to compete once, or to make it a lifestyle, requires deciding to make a lifestyle change. To truly prepare for a competition requires working out and eating right consistently and long term. Its worth it, and at Reb-L we can teach you how. Pilates is a workout system developed to rehabilitate injured soldiers during the World War I. Joseph Pilates, an intern at a POW camp hospital developed the workout using bed frames and bed springs. It was designed to activate core muscles, increase flexibility, and work the entire body from its center, or powerhouse. Pilates has evolved into an effective and challenging program applicable to everyone from body builders to endurance athletes to those recovering from surgeries and injuries. Pilates also helps develop muscular endurance, coordination, body awareness and improved respiration. The Reb-L Fit Program is classically designed, following the workouts put together by Joseph Pilates. It will improve range of motion, flexibility, circulation, posture and abdominal strength, as well as decreasing back, neck and joint pain. I offer full Pilates workouts on the Pilates Reformers in private sessions, semi-private sessions and small groups of three. Workouts incorporate specially selected exercises on all the Pilates equipment (reformers, chairs, towers, barrels and mats) designed for the individuals participating. The workouts are challenging and focused on the needs and progress of the individuals. The Reb-L Flex workout is a circuit workout for larger groups of up to 6. The workout follows selected exercises from the classic Pilates series. Participants follow a circuit format, moving from one piece of equipment to another to provide challenge and variety to the group members. This workout is ideal as a supplement to the private, semi-private and small group sessions, as well as to any weight training, endurance training or sports program. It educates the members to move correctly, stabilizing and working from the core, strengthening small supporting muscles and increasing flexibility. If you are new to Pilates, you should begin by meeting privately for a free 30 minute trial session. Together we will discuss limitations and goals, then work through a session to determine your abilities and ideal workout setup. I will help you determine if 30 minute, hour, private, small or large group sessions will best serve your needs. The Reb-L Fit mat Pilates workouts are another excellent way to incorporate core strength and flexibility work into any training program. The groups allow up to 6 members, and all abilities are welcome. The mat workouts follow movements adapted from the classic reformer workouts, and include modifications and variations to challenge everyone. The “Big Lifts” in bodybuilding and power lifting are squats, dead lifts and the bench press. We have added the overhead press to the list to complete our profile of lifts for full body training. Strength training is also an awesome way to develop relative strength (your strength in relation to your body weight), increased fat burning potential due to increase caloric output and muscle mass and improved performance (a stronger muscle is a faster and more powerful muscle). The movements inherent to the “Big Lifts” all exist in our natural body movements. It’s important to learn their proper execution, whether you are a power lifter, body builder, fitness enthusiast or a beginner!! They apply to everyone, and variations of each are part of our programming. Correct movement is essential, to protect you from injury whether you are actively working to gain strength and lean mass, or simply adding weight training to your fitness regimen to give balance to your programming. I work to educate you in performing these lifts. I observe your execution of each movement, and based on your goals, we program axillary work to address the weaknesses you have in each one. We work together to set goals and progressions to your workouts based on your abilities and interests. I offer a variety of weight training options. Personal training, semi-private sessions, and small groups workouts (3-5 members) are all workouts planned specifically for the participants, with their abilities and goals in mind. Personal training (including semi private and small group) can be scheduled whenever you and I are available. Your personal program can be set up to help your reach the strength and leanness that you have always hoped for, or even prepare you for a power lifting competition, a bodybuilding, figure or bikini competition!